The sun has been shining for more than 4 days straight and the humidity has arrived. That means BBQ season is fast approaching! It’s time to dust off the grills and break out the charcoal for some good ‘ole outdoor cooking. Now, if you’re like my friends and me, you’ve actually been grilling all year – that’s right, even in the rain in the middle of winter we were out there grilling up some steaks! Whether you grill in the summer or year round, experience grillers know that the quality of your food relies on charcoal temperature, air circulation, cooking time, marinades and sauces! 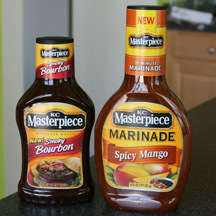 KC Masterpiece has introduced two new flavors in preparation for this year’s grilling season. Original created back in 1978 in Kansas City (get it? KC Masterpiece = Kansas City Masterpiece,) KC Masterpiece has been creating delicious barbeque sauces, marinades and seasonings for over 30 years. 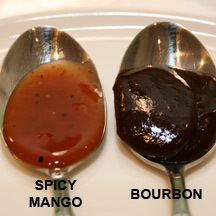 Recently, they have added the new Smoky Bourbon Barbeque Sauce and the Spicy Mango Marinade to their product line-up. In addition to the new flavors, new KC Masterpiece product packaging hit the stores last month with an updated look and vibrant colors and pictures. Already fans of KC Masterpiece (with stockpiles of KC Masterpiece BBQ Seasoning in their cabinets,) my friends were eager to test out the new KC Masterpiece sauces, so we scheduled a grilling date – rain or shine, where we would grill up some chicken, burgers and hot dogs to put these sauces to the test. When you first smell this, it smells surprisingly spicy. The official description says there’s a “hint” of pepper, but in smell, it’s more like “hit you in the face, the cayenne pepper is HERE!” You also catch whiffs of the mango flavor, but it’s very muted and doesn’t smell overly sweet or fruity. The texture of the marinade is similar to a syrup that oozes but isn’t too thick. I’m sure that the texture helps it to creep into every crevice of the meat you are marinating while still being thick enough to stick to the meat a little bit. Tasting the marinade right out of the bottle I thought the cayenne pepper was pretty strong – stronger than I expected – and it seemed to be more prominent than the mango flavor, which was like a deep fruit flavor. I’ll admit that after smelling and tasting the marinade, we were all a little apprehensive – it just wasn’t what we were expecting. Ever the diligent testers, though, we used the KC Masterpiece Spicy Mango Marinade to marinate some chicken breasts. As directed, we let the meat marinate for at least 30 minutes. If you want more flavor, you can let your meat marinate longer and also baste the meats while they’re being cooked. After the chicken came off the grill all apprehension disappeared with the first bite. All of the strong spiciness and the subtle mango-ness somehow transformed into the perfect blend of flavors. The flavor wasn’t too strong or too spicy and resulted in a chicken that had a subtle tropical flavor with a kick to it. I thought that the chicken tasted nothing like how the marinade smelled, and tasted delicious. The Spicy Mango chicken disappeared quickly and a couple of the testers declared this chicken the best of the night. The perfect blend of rich tomato, molasses and spices is getting spiked – bourbon has been added to the original flavor for a smoky, sweet taste to which you just may want to raise a glass. The KC Masterpiece Smoky Bourbon Barbeque Sauce smells almost like how you would expect it to smell. It has a strong BBQ flavor but I was a little worried that I couldn’t smell any of smokiness. It seemed to almost have a sweet and sour smell, which is probably due to the sweetness of the molasses and tomatoes next to the bourbon. The missing smoky flavor magically appears when you taste the sauce followed by a more subtle sweet barbeque flavor. The sauce is very, very thick to help ensure that it sticks to the meat while it’s on the grill. KC recommends that you baste your meats with the sauce in the final 5-10 minutes of cooking. We tried the KC Masterpiece Smoky Bourbon Barbeque Sauce on both chicken and burgers. Unfortunately (or fortunately) the burgers were grabbed and eaten so fast, I didn’t have an opportunity to take a picture of them with the sauce on them. However, I was able to grab a picture of the chicken. You can see that this chicken came out a lot darker than the Spicy Mango marinade. It had a wonderful BBQ flavor to it, but I thought that the Smoky Bourbon sauce really shined on the burgers. Once again, all of the flavors – barbeque, smoke, and bourbon – seemed to find their harmony during the cooking process, infusing the beef burger with a wonderful overall barbeque experience. Neither flavor was too strong or too weak, and the flavors worked themselves into the meat so that each bite had a burst of the Smoky Bourbon sauce. KC Masterpiece really helped to make our cookout a delicious experience by providing new flavors to try with our grilling meats. If you want to add a little bit of oomph to your food this summer, or throughout the year, then take a look at KC Masterpiece. KC Masterpiece sauces, marinades and seasonings are available in stores and grocery stores nationwide for $1.89 to $3.49 (depending on size and product.) For more information about KC Masterpiece and any of their products, please visit www.KCMasterpiece.com. What’s Cooking at DD KC Masterpiece Giveaway! The Prize: 5 winners will each receive one bottle of the two new KC Masterpieces flavors – Smoky Bourbon and Spicy Mango! THIS ENTRY IS REQUIRED FOR ALL OTHER ENTRIES TO BE VALID (+1): Remember to post this as a comment. Visit www.KCMasterpiece.com and let me know which flavor/product you would like to try the most AND which food you would use it on. Giveaway ends at 11:59 PM EST, May 13, 2010. Disclaimer: This post consists of my (and/or fellow tester) opinions only. No compensation was given for this review/giveaway. I did receive free KC Masterpiece products from the manufacturer or representing PR agency to use and test for the purposes of this review. This did not affect the outcome of this review. I would love to try the Hickory Brown Sugar BBQ Sauce on some Boneless Pork Ribs. Yum! I want to try the smokey bourbon sauce on some grilled chicken with rice! I'd love to try the Roasted Garlic Balsamic Marinade on steaks! I'm always looking for a new marinade to try with steaks!! [email protected] I like the Ginger Teriyaki Marinade and I'd use it on my chicken. I would love the spicy Mango or Roasted Garlic Balsamic Marinade on steaks. yum! I like the Hickory Brown sugar KC Masterpiece sauce on pork: It's delicious! I would use the hot and spicy on chicken that I grill out. I woudl love to use the KC Masterpiece® Chipotle & Lime Marina on some chicken! I would like to try the hickory brown sugar and I know it sounds strange but I would use it on french fries. I want to try the Sweet & Tangy sauce on chicken! 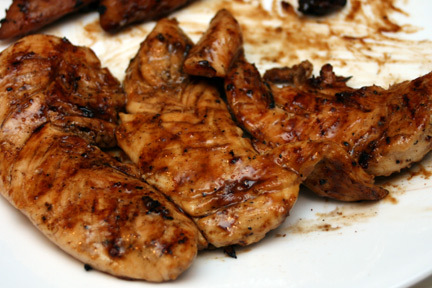 I would love to try the KC Masterpiece® Honey Teriyaki Marinade on chicken. 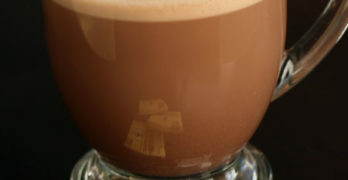 I would love to try the Hickory Brown Sugar. 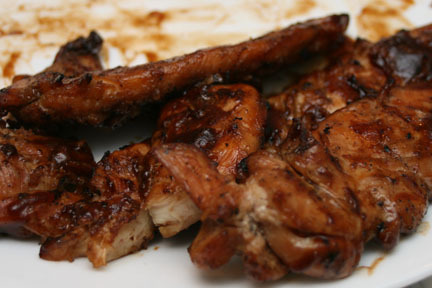 We love the Carribean Jerk marinade. Yummy! I'd love to try the Ginger Teriyaki marinade on chicken. I'd like to try the Sweet & Tangy BBQ Sauce on some boneless pork chops. I actually wanted to try the Ginger Teriyaki but decided not to repeat what the person in front of me had. Oh Heck, I want to try them both! I'd like to try the Sweet & Tangy BBQ Sauce on some boneless pork chops. I actually wanted to try the Ginger Teriyaki but decided not to repeat what the person in front of me had. Oh Heck, I want to try them both! I would use the Smoky Bourbon on ribs. I would llove the original on grilled chicken. I'd like to try the roasted garlic balsamic marinade! I would use smokey Bourban on pork chops. I would use the Chipotle and Lime Marinade on chicken! Yum! The garlic and herb marinade on chicken that we'd cook out on the grill. The garlic and herb marinade for some boneless chicken breasts sounds amazing. I would really like to try it out! I've tried several of the marinades and they have all been great. We use the Caribbean Jerk on shrimp kabobs. The lemon pepper marinade would be great on chicken.Thanks for the giveaway. The lemon pepper marinade would be great on chicken. I would most like to try the chipotle and lime marinade on a london broil. Chipotle & Lime and I would use it on Shrimp. I've tried their original sauce and it's very good. The Smoky Bourbon sounds delicious! I'll use mesquite and it'll go on chicken. I'd like to try KC's Sweet and Tangy bbq sauce on a slab of baby back ribs. I'd like the Sweet And Tangy on pork chops! i want to try the bourbon on fries! I would marinate Mahi Mahi in the chipotle lime mardinade. yum! Following WCatDD on Facebook. My name: Sarah U.
I'd like to try the ginger teriyake marinade on chicken. I would use the Hickory Brown Sugar on baby back ribs! Thanks! I want to try the spicy mango on country style pork ribs! I like Smokey Bourbon on pork. I'd like the Garlic and Herb marinade on Spare ribs! I would like to use the Mesquite BBQ sauce on pork chops. I'd like to try the Honey Barbeque Sauce on chicken. Chipotle and Lime; it would be used on chicken on the barbecue! I would use the Smoky Bourbon on T bone steaks. I would try the Steakhouse marinade on a nice filet. Thanks! I'd like to try the spicy bourbon on some steak. I would use the caribbean jerk marinade on my chicken!! Wow. Did not know about the spicy mango marinade — would love to try it on chicken. We also like the chipotle & lime on chicken for fajitas. I used Hickery Brown Sugar BBQ Sauce on country style pork ribs. I'd use the KC Masterpiece Mesquite on chicken. I would love to try the Honey BBQ sauce on chicken. Thanks for the giveaway! Hickory brown sugar bbq sauce on steak. I would put the Hickory Brown Sugar BBQ Sauce on baby back ribs. I would like the spicy mango on chicken breasts. Hey DD, sorry if I filled out the form twice, I wasn't sure if I did or not, and wanted to make sure my bonus entries counted!